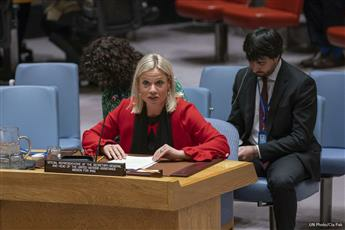 The Special Representative of the Secretary-General for Iraq, Jeanine Hennis-Plasschaert, underlined this morning to the Security Council, the need to finalize the formation of the Government of Iraq to preserve the achievements and maintain the "optimism" that has reigned in the country since the end of the occupation of Daesh, which still left "incubators of residual terrorism", in the words of Iraq. Ms. Hennis-Plasschaert, who is also Head of the United Nations Assistance Mission for Iraq (UNAMI), presented two reports * of the Secretary-General. She welcomed the appointment by consensus of the new Prime Minister of Iraq, Adel Abdul-Mahdi, four months ago, and said that the Government remains incomplete with four vacations, including the ministries of defense, interior and justice which are the subject of deep disagreements, while the session of the Parliament of Iraq is suspended. The formation of the government is, however, essential for consolidating security gains and working for the rehabilitation of the country, said the Special Representative. For if her military defeat has given way to optimism and hope, Daesh, she warned, continues to pose a threat to Iraq and the region. The eight delegations who spoke also expressed the wish for the rapid formation of the Government of Iraq. The establishment of an inclusive government, Côte d'Ivoire said, would enable the necessary urgent reforms to be implemented. The new Government, which has engaged South Africa, must begin to fulfill the promises in terms of security, the dignified return of the displaced, the rehabilitation of public services and the revitalization of the economy. The "ambitious" political program of the new Prime Minister has been hailed by Equatorial Guinea. Kuwait underscored the importance of international cooperation, but regretted that the twenty-eighth anniversary of Iraq's invasion of its territory had been tainted by the still pending question of the return of the remains of many Kuwaiti missing persons. . Iraq has indicated that it is giving due attention to this issue. We are now entering, he said, in a phase of "security confrontation" with the "incubators of residual terrorism". "It's also a phase of" intellectual battle "to roll back radicalization. Realism and determination will be crucial to the long-term stabilization of Iraq, which is far from easy, the Special Representative said, deeming "crucial" international support. The Special Representative also welcomed the agreement signed on 16 January between the Federal Government and the Kurdistan Regional Government to harmonize customs practices. Negotiations for the formation of the government in the Kurdistan region are continuing. Support for the stabilization of the country remains an international priority, while respecting the sovereignty and territorial integrity of Iraq, said the Special Representative, for whom the security situation remains worrying. Despite its military defeat, Daesh continues to pose a threat to Iraq and the region, she said, with support from the United Nations Assistance Mission for Iraq (UNAMI). She added that the Iraqi authorities condemned the Turkish strikes in the north of the country against the Kurdistan Workers' Party (PKK) and called on the two countries to embark on the path of dialogue. Mrs Hennis-Plasschaert stressed the need for a good administration of justice in the country; the repression of the crimes committed by Daesh being a key element for the cohesion of Iraq. She deplored the low participation of women in decision-making processes and urged political leaders to address them. This year, the humanitarian community will focus on the needs of 1.75 million vulnerable Iraqis, including internally displaced persons. We need, the Special Representative said, $ 700 million to fund the 2019 Humanitarian Plan. She said that since the International Conference of February 2018 for the Reconstruction of Iraq, 53 projects have been launched. including public services, protection and reconciliation. As for the issue of missing Kuwaiti nationals and the return of Kuwaiti property, a "priority" of her mandate, she called on States to strengthen their support through the provision of technical teams and teams of forensic doctors. The Special Representative said that the atmosphere of desperation during the occupation of Daesh has given way to optimism and hope. However, she warned, we can not turn a blind eye to the fact that the long-term stabilization of Iraq, eagerly desired, is far from easy, Hennis-Plasschaert said. Realism and determination will be crucial to the challenges ahead. The commitment of all Iraqi constituents will be crucial, political will will be a prerequisite and pride in a shared history and common future will be needed, she said, adding that continued support international will be crucial. Mr. MANSOUR AYYAD SH. A. ALOTAIBI ( Kuwait) commended UNAMI's efforts to address humanitarian needs and create the conditions for sustainable development in Iraq, in cooperation with the United Nations country team. While we recognize that the current phase, marked by the victory against Daesh, is crucial for Iraq, we stress that international efforts are essential to provide assistance to the Iraqi people, especially since it will be necessary to redouble efforts to promote reconciliation. In this regard, he welcomed the national dialogue and said that since the emergence of Daesh, Kuwait had spared no effort to help Iraq, concerned about the continuing threat posed by terrorist organizations to the stability and security of the region. Mr MUHSIN SYIHAB ( Indonesia) welcomed, in turn, the formation of the new Government and looked forward to appointments to the remaining ministries. He also hailed last year's elections in the Kurdistan region and progress in relations between Baghdad and Erbil. He called for the resolution of outstanding issues through dialogue and consensus, in accordance with the Iraqi Constitution. With regard to security, he noted that terrorism remained a serious problem, with the active presence of Daesh in several Iraqi provinces and in isolated areas. He paid tribute to the Iraqi Security Forces and called for a comprehensive approach to security challenges. In this regard, he considered that strengthening regional and international cooperation is essential, as is the support of the United Nations Mission, whose work he praised. He particularly commended efforts to improve relations between Iraq and the countries of the region, including Kuwait. The closure of the files on the missing persons of Kuwait can only consolidate the relations between these two "brother countries", insisted the representative. Mr MA ZHAOXU ( China ) stressed the need to work for Iraq's cohesion, adding that any international support must respect the sovereignty and territorial integrity of the country. Iraq is at the forefront of the terrorist threat and we must help it. The representative supported the efforts of the United Nations to ensure that crimes committed by Daesh are punished. My country, he said, supports the efforts of UNAMI and the recovery of the Iraqi economy. Mr. JERRY MATTHEWS MATJILA ( South Africa ) commended the Iraqi authorities for the progress made in forming a national government, and encouraged all stakeholders to work together to finalize the cabinet. It is an essential step for the Government to begin fulfilling its promises on security, dignified return of displaced persons, rehabilitation of public services, and the revitalization of the economy and reconstruction. The representative encouraged the Government of Iraq to involve women more in the political process and to ensure that they are represented at all levels of the political structures. He expressed his concern over the threat that Daesh continues to pose, according to the Secretary-General. He supported Iraq's efforts to prosecute and bring to justice those responsible for the crimes committed in the country, in accordance with Security Council resolution 2379, and supported the mandate of the United Nations Assistance Mission in Iraq ( UNAMI). South Africa, he said, welcomed the greater involvement of regional organizations in the Iraqi political process and reaffirmed their role in supporting the Government of Iraq in rebuilding the country. The representative welcomed the resumption of cooperation between the Federal Government of Iraq and the Kurdistan Regional Government and encouraged them to build consensus on the outstanding issues. Mr GBOLIÉ DÉSIRÉ WULFRAN IPO ( Ivory Coast) regretted the persistence of dissension among the country's various political forces, which prevents Prime Minister Adel Abdul-Mahdi from forming a new government. However, after the military defeat of Daesh, the establishment of an inclusive government would, he noted, have allowed for the implementation of urgent reforms to address the many challenges facing Iraq. Côte d'Ivoire therefore urges all political actors to give priority to the national interest by overcoming these dissensions. The representative also encouraged the continuation of a constructive dialogue between the central government and the authorities of the autonomous region of Kurdistan, in order to find a peaceful solution to the dispute arising from the organization of the referendum of self-determination of this region on September 25 2017. Mr. JOB OBIANG ESONO MBENGONO ( Equatorial Guinea ) welcomed the appointment four months ago of the new Prime Minister, Mr. Adel Abdul-Mahdi, and his "ambitious" political program, which raised a real popular hope. Nevertheless, he expressed concern at the difficulties encountered in forming the Government of Iraq. The parties must reconcile their positions so that they can focus on the country's recovery, he said. He recalled the asymmetrical threat still posed by Daesh before calling on Turkey and Iraq to resolve the security situation in northern Iraq, while respecting Iraq's sovereignty. He welcomed the elimination of customs posts between Iraqi Kurdistan and the rest of Iraq. The country has also set itself the goal of meeting the challenges that it faces with the support of the international community, particularly in the field of education, which was "vibrant in the 1970s". He called on the "friends and brothers" countries to fulfill the commitments they made at the International Conference for the Reconstruction of Iraq, held last year in Kuwait. Mr. Aluloom called on Member States to support the rehabilitation of archaeological sites destroyed by Daesh and requested their inscription on UNESCO's World Heritage List. He also called on them to strengthen the Iraqi Armed Forces, be they military, police, "or even peshmerga". We are entering now, he said, in a phase of "security confrontation" with the "incubators of residual terrorism". It is also a phase of "intellectual battle" to roll back radicalization. With regard to relations with countries in the region, the delegate denounced Turkey's attacks and incursions in the north of the country, which he considered unacceptable for whatever reason. Relations with the "brother Kuwait" have flourished considerably, he said, adding that Iraq's importance for the restitution of the remains of the Kuwaiti disappeared. [size=30](KUNA) - The United Nations on Wednesday welcomed Kuwait's role in raising funds for humanitarian programs in Iraq, vowing to deal with the file on Kuwaitis, third-country nationals and missing Kuwaiti property. 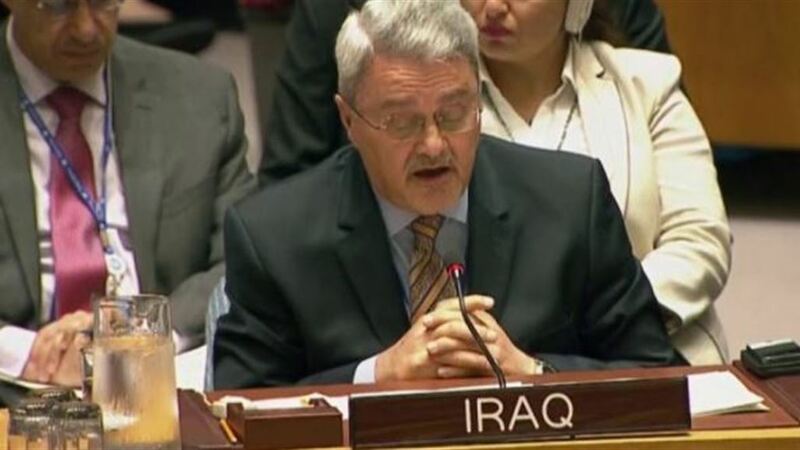 In a speech at a UN Security Council session on Iraq, the head of the UN Assistance Mission for Iraq, Hennes Plassert, urged political actors to overcome internal fighting and allow compromises to prevail for the benefit of the Iraqi people. "It is time for leaders in Iraq to shift the focus from factional politics to investing in meeting the immediate needs of citizens," she said. "Despite the formation of the government, Iraq is still incomplete." "This step reflects the government's efforts to improve the provision of basic services. However, funding for reconstruction in the liberated areas is much less than what is required, especially as the state finances strongly," she said, referring to some positive developments, including allocations for the electricity sector's 2019 budget. On the revenues of the oil sector, which is exposed to fluctuations in oil prices while corruption is still widespread and fighting is not easy. " Although the terrorist activities have decreased, "the Da'ash organization continues to pose a security threat to the entire region, while armed groups are expanding their economic and social reach," she said. At the humanitarian level, Placert said the United Nations aims to meet the needs of 1.75 million vulnerable Iraqis this year as the humanitarian response plan for 2019 seeks 700 million dollars from donors. called the representative of Iraq at the United Nations, Wednesday, world cooperation "intelligence" to prosecute terrorists, as he emphasized the government 's success in providing the salaries of all employees in the current year budget including the Peshmerga fighters. "The government has succeeded in providing salaries for all employees in 2019, including Peshmerga fighters," Mohammad Bahr al-Ulum said in his speech during the special session of the UN Security Council held today. He stressed that science "Iraq has begun to implement programs for the employment of young people and the promotion of education and health," calling for "the international community to fulfill its obligations to Iraq." He called on the representative of Iraq, "all countries to cooperate intelligence to prosecute and hold terrorists accountable." The United Nations Security Council, (at 6 pm Wednesday Wednesday, Baghdad time), a meeting to discuss the political and security situation in Iraq. UN marks "political fighting" in Iraq and warns of "big"
The new UN envoy to Iraq to end what it called the political fighting in order to complete the formation of the government, warning that further delay in this matter could lead to "significant repercussions" on the stability of the country. The Iraqi people "bear the brunt of the political stalemate" at a time when it is necessary to meet demands for better services, with water and electricity at the top of the list, Janine Hines-Plasschart told the Security Council. "There are still four ministerial portfolios vacant, and there are sharp differences on three of them - defense, interior and justice." Haines-Plasschart urged political parties to make concessions. "The time has come for Iraqi leaders to abandon sectarian politics and make efforts to meet the urgent needs of Iraqi citizens, because further delays could give room for serious consequences for the stability of the country," she said. Iraqi political leaders stated that there were well-qualified women and their participation in senior positions remained very limited. She reported that she set up a women's advisory group on reconciliation and politics on January 24, which will provide independent advice to the UN political mission in Iraq and elsewhere. "The parties and blocs in the country are working to overcome all obstacles so that an agreement and a government can be reached, which will contribute to the stability of the whole region," said Mohammed Bahr al-Ulum, the Iraqi ambassador to the United Nations. The Security Council said in a press statement that it looked forward to Iraq completing the formation of its government "in order to strengthen Iraq's sovereignty, national unity, independence and regional integration, and to meet the needs of all Iraqis, including maintaining security and combating terrorism." The council called on Iraqi parties and groups to maintain priorities for political, economic and social reforms, fight corruption, and "promote reconstruction, economic development, accountability, stability and prosperity." The Permanent Delegation of Kuwait to the United Nations made a presidential statement to the Security Council on developments related to the search for Kuwaiti missing persons, third-country nationals and Kuwaiti property, including national archives. The draft presidential statement circulated by the delegation states that the Security Council recalls its resolution 2107 (2013) on the situation between Iraq and Kuwait and all its previous presidential decisions and statements dealing with issues of missing Kuwaiti and third-country nationals and the return of Kuwaiti property, including national archives, Taking note of the reports of the Secretary-General submitted pursuant to paragraph 4 of resolution 2107 (2013). In accordance with the draft, the Security Council stresses UNAMI's continued efforts to implement resolution 2107 (2013) and expresses its full support to the Special Representative, the Mission's Head of Mission, Jeanine Blachachart, and the Deputy Special Representative for Political Affairs of the Mission, Alice and Paul, in their efforts to resolve outstanding issues relating to women Kuwaiti and third-country nationals and the return of Kuwaiti property, including national archives, and urge them to continue working on these issues. The Security Council expresses its profound gratitude to the Special Representative of the Secretary-General and to the former United Nations Mission in Afghanistan, Kofi Annan, for his tireless efforts to fully implement resolution 2107. The Security Council, in the presidential statement, notes the strong bilateral relations between Iraq and Kuwait and commends the continued support of the Government of Kuwait for Iraq's stabilization efforts and welcomes Iraq's efforts to meet all remaining commitments in accordance with the relevant Security Council resolutions. The Security Council also notes the ongoing cooperation between Iraq and Kuwait in the search for missing Kuwaiti and third-country nationals and the positive efforts of the Iraqi Ministry of Defense in this important humanitarian endeavor and encourages the Iraqi Government to continue to make these efforts in the same constructive spirit and to ensure that all institutional and financial support And the appropriate technical capacity to facilitate future activities and also encourages the international community to provide the necessary advanced and innovative technical equipment to the Iraqi authorities to help identify burial sites in accordance with best practices. The Security Council shares the view expressed by the Secretary-General in his reports that the verification of the fate of missing persons and the provision of responses to their bereaved families depend on demonstrating firm commitment and taking action and adopting new and innovative ways of advancing the issue. The Security Council expresses its strong support for the perseverance of the members of the tripartite mechanism and its Chairman, the International Committee of the Red Cross (ICRC), in their efforts to find the remains of missing persons. The Security Council is informed of the last meeting of the Technical Subcommittee of the Tripartite Commission on 11 December 2018 and the last meeting of the Thirteenth Committee on 13 December. The Security Council welcomes the continued commitment of the Government of Iraq to return all remaining Kuwaiti property, including the national archives, and notes the important steps recently taken by the Governments of Iraq and Kuwait to activate this file and welcomes the special process of handing over a batch of Kuwaiti property paid by President Barham Saleh during his recent visit To Kuwait last November. [rtl]The draft presidential statement circulated by the delegation states that the Security Council recalls its resolution 2107 (2013) on the situation between Iraq and Kuwait and all its previous presidential decisions and statements dealing with issues of missing Kuwaiti and third-country nationals and the return of Kuwaiti property, including national archives, Taking note of the reports of the Secretary-General submitted pursuant to paragraph 4 of resolution 2107 (2013). According to the draft, the Security Council stresses UNAMI's ongoing efforts to implement resolution 2107 (2013) and expresses its full support to the Special Representative, the Mission's Head of Mission, Jeanine Blachachart, and the Deputy Special Representative for Political Affairs of the Mission, Alice and Paul, in their efforts to resolve outstanding issues relating to women Kuwaiti and third-country nationals and the return of Kuwaiti property, including national archives, and urge them to continue working on these issues. The Security Council expresses its strong support for the perseverance of the members of the tripartite mechanism and its chairmanship of the International Committee of the Red Cross in their efforts to find the remains of those missing. The Security Council is informed of the last meeting of the Technical Subcommittee of the Tripartite Commission on 11 December 2018 and the last meeting of the Thirteenth Committee on 13 December.